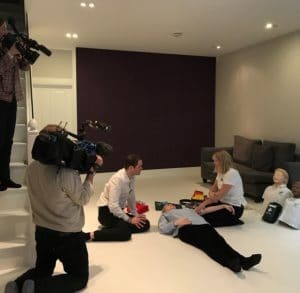 We were delighted to be contacted by BBC producer and broadcast journalist, John Henry Owen, wanting to film a demonstration of first aid to help someone who has been a victim of knife crime. 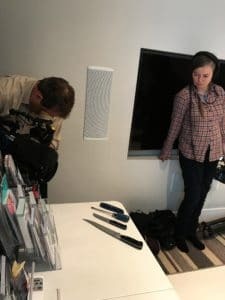 The segment was being filmed for the BBC in media response to the spate of knife crime across the UK. 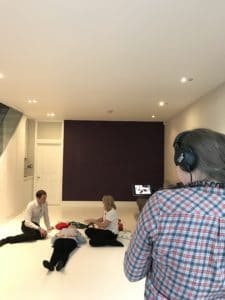 The filming was to illustrate how to respond effectively when someone has been stabbed, clearly stating what to look for, what to be aware of and, crucially, how to stop a catastrophic bleed. In the case of a catastrophic bleed the victim can bleed to death in under three minutes. So response time is crucial. We also ran through how to apply a tourniquet (seen here in the photo below is a bright orange tourniquet) and how every day items – such as a cotton scarf – can effectively double as a tourniquet although items such as a leather belt is unsuitable. As John interviewed me, I demonstrated the first aid on a colleague from the First Aid for Life office lying on the floor. It was fascinating watching the two camera operators at work, getting the camera angles right…..
Do watch out for the segment on the BBC news. It will be aired sometimes shortly in the future. 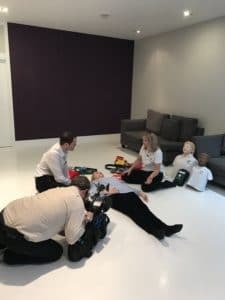 We are delighted to have been given the opportunity to share our first aid for anyone who might be faced with a situation where they can save someone’s life.